If you’re like me, you’ve probably made some terrible decisions involving online deal sites like Groupon and LivingSocial. There was the time I bought a voucher for two dozen cupcakes, which I cashed in the day before it expired with no party in sight. Twenty-four cupcakes is a lot for two people. I’ve traipsed to the far outer reaches of my city because I forgot to check where exactly that new restaurant was located. I also received an awful haircut from a salon attached to a bar. But worst of all are the deals I never redeemed. I’m still thinking about that bikram yoga deal that seemed like such a good idea in my over-air-conditioned cubicle. Somehow, once the feeling had returned to my fingertips and I realized how terrible it sounded to spend an hour doing stretches with sweaty strangers, I just couldn’t bring myself to cash it in. So I’m turning over a new leaf. Much as I love a bargain, if I buy the voucher and never use it, it’s no longer a good deal. It’s a waste of money. From now on, before I hit the purchase button, I’m asking myself these questions to decide if the deal is a bargain or a bust. Is This Actually a Good Price? Just because there’s a discount, it doesn’t mean your purchase is actually worth the cost of the voucher. Do some digging. If the offer is for a $150 overnight stay in Atlantic City, what is the typical cost of a full-price room in a comparable hotel? And while $20 for $40 worth of food seems like a steal, it’s less exciting when you look at the menu and discover a ridiculous markup that will inflate your check in no time. I’m especially wary of the merchandise deals. While the sticker price is sometimes tempting, it’s tough to get a feel for the item’s quality. And don’t forget to check out the shipping costs and return policies. If the answer is yes, then it’s a no-brainer. If I would go for it without the deal, then I may as well save a couple of bucks. A no to this question isn’t necessarily a deal-breaker, either, since I use these deals to access items that wouldn’t normally be within my price range. I probably wouldn’t go for a Swedish massage if it wasn’t on sale, but I use this question to gauge my level of interest in the deal. Will I Use This in the Next Month? If I’m excited enough about the deal that I’m going to run out and use it in the next four weeks, it might be worth grabbing. 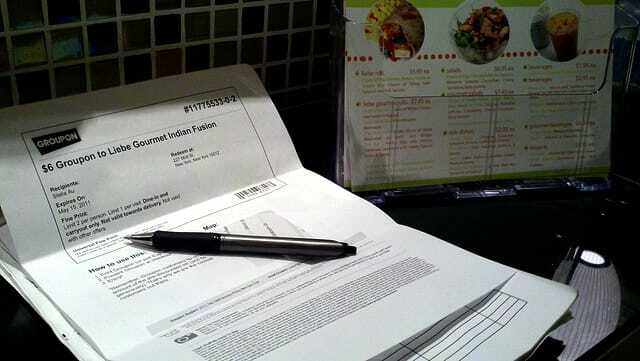 When my favorite Indian restaurant popped up on LivingSocial, I bought the voucher and used it the next week. However, if I could see myself putting off this activity and having to use the voucher at the last minute (or, even worse, not at all), then I should skip this one. Some of the deals I end up buying are not things I’m realistically going to do. I’ve started asking myself if I’m thinking about buying this because I want to be the kind of person who would use it. Psychology 101, friends. Cheap online vouchers enable us to deceive ourselves about who we really are (and which deals we will really redeem). Do I really want to tour that historical mansion an hour away? Or do I just want to be cultured and sophisticated enough that this would be something I’d do? (Spoiler: It’s the second one). Why Is This Deal Being Offered? There are plenty of reasons for a business to offer an online voucher. Sometimes a new business does it to drum up interest and get people in the door. Other times, the deal has restrictions that help an establishment bring in customers at off-peak hours or during slow season. However, once in a while you’ll come across a business that turns to online deal sites because there’s a good reason it isn’t getting traditional customers. Restaurants and hotels with low online ratings often show up on these sites. That salon that gave me the bad haircut? It wasn’t even on Yelp. A quick Google search for the business will show you if that tapas bar is rocking a one-star rating because of a streak of bad shellfish or if that gym is full of creeps. If that’s the case, steer clear! Your Turn: What is your criteria for buying online vouchers? More importantly, what’s the worst online deal you’ve purchased? Lyndsee Simpson is a writer and editor living in Washington, D.C. She currently has an unused hot-air balloon ride she needs to cash in.